In Lagos, developing the capital city’s infrastructure remains a priority for the Lagos State Government. This official commitment toward infrastructure provisioning has often resulted in mass evictions and large-scale displacement of city inhabitants, especially the urban poor who live in the informal settlements, also known as slums. There is currently no legal framework that espouses how to conduct mass evictions less painfully or to mitigate the oft deleterious impacts on vulnerable groups, especially women and children. To fill this gap, SPACES FOR CHANGE is proposing to draft an eviction guideline as an important step forward to the acknowledgement of the rights of slum communities to be protected against forced evictions and homelessness. What should be the contents of such guideline? This was the theme of S4C’s policy drafting meeting held on November 7, 2017 in Lagos. 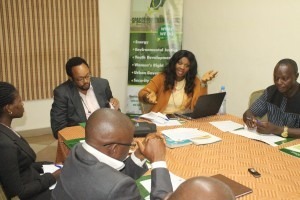 Participants comprised of officials of Lagos ministries, town planners, estate valuers, surveyors, activists, urban experts and representatives of landlords’ association and informal communities. Two major issues dominated discussions at the meeting. The first issue relates to the role of security agencies during evictions. Instances of overzealous security operatives perpetrating gross human rights violations during eviction exercises, abound. ‘Security agencies overdo the tasks assigned to them. No government will ask security agents to kill innocent citizens. Their proper role is to protect lives and property, not to brutalize, maim and kill,’ Tpl. Ayo Adejumo argued. A participant argued that resistance to evictions often triggers the use of excessive force by security agencies. Naturally, humans become attached to an environment or locality where they have lived for so many years. So, this makes them unwilling to move to a new area. Because security agents would insist on carrying out the eviction exercise as scheduled, they resort to using force to expel unwilling residents. Unwillingness to move is often regarded as an affront to constituted authority. It is important to underline that it is not the responsibility of security agents to relocate. They are only required to be present at the eviction site in order to secure lives and property, and to maintain peace and order. An eviction guideline should therefore, contain provisions that clearly define the role of security agents monitoring an eviction. Participants recommended sections that obligate the delegating authority to sensitize security agents on their roles and limits of their power during eviction exercises. Secondly, the guidelines should clearly set out the consequences for overreaching that power. It is also important to insert grievance or complaint procedures that enable aggrieved persons seek redress for abuse of police power during evictions. A second issue extensively discussed at the meeting is the issue of notice. What does adequate notice mean? How long enough time is adequate? The preponderance of suggestions showed that 6 months to 1 year notice would generally be sufficient. For Mr. Niyi Ajayi, the representative of Balogun Landlords Association, the problems faced by property developers range from encroachment, street trading, illegal structures etc. Giving adequate notice will minimize resistance and excuses. Closely related to the issue of notice is the scope of the guideline. Would the guideline prescribe rules for conducting evictions affecting residential or commercial spaces? Would it address all types of evictions, or only regulate evictions targeted at informal settlements? Varied feedback from the diversity of participants, especially from the landlords, suggest that the draft guideline should address different forms of eviction affecting both commercial and residential spaces. Developers and landlords in the Balogun area want the government to provide an alternative space for street traders; to subsidize informal trading as well as low-income residential accommodation in order to reduce the alarming poverty levels in the country. Balogun sits at the heart of Lagos State Central Business District (CBD). Without providing alternative spaces for traders and low-income earners, there would be no end to the ever-rising incidents of encroachment in the CBD. A lot of people presently live in squalid conditions. For instance, some persons live in commercial underground diesel tank without authorization. If the government forcefully evicts these people, the evictees will push-back and the fallout will be dire for commercial property owners. Evictees may resort to violence when evicted forcefully, creating security threats to the properties in the area. Properties may get vandalised or torched during mass evictions and tensions tend to escalate afterwards. Landlords often bear the brunt of these infractions between the government and the evictees. That is the reason why the use of force must be avoided when it becomes necessary to remove certain persons from an area. Mr. Lookman Oshodi of Artic Infrastructure believes that restructuring of Central Business Districts should not be physical alone. The State should take into consideration the underlying social and economic push-factors to the area. There is no need to criminalize informal trading or seizing their wares. Instead, specials hubs may be created for mobile traders to carry out their trading activities. Stationed traders should also be availed with affordable spaces where they can practice their trade with minimal harassment. Traders also need to consider shared spaces. In this case, several traders can operate within a common space with shared operations, management and accounting desks. The guidelines should contain special rules for conducting evictions in commercial properties. Notice to be given to occupiers of commercial buildings should not vary from that of residential spaces. Prescribed notice remains between 6 months to 1 year. But for mobile traders, notices should not be less than one to three months.